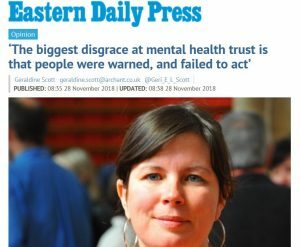 We distributed about 100 copies of an open letter written by NSFT nurses in Norwich caring for people from Great Yarmouth & Waveney which exposes this ‘consultation’ as a sham. 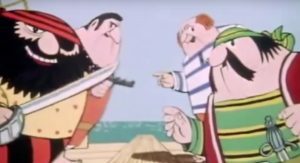 Every NSFT and CCG director present was given a copy by hand and from their solemn faces they did not appear to find our exposure of the truth enjoyable reading. 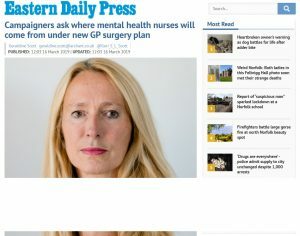 The EDP posted a copy of the open letter on its website yesterday. 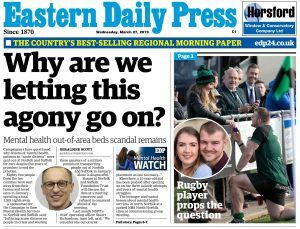 The sham consultation is featured in today’s EDP. A campaign spokesman was interviewed on BBC Radio Suffolk during the Stephen Foster prime drive-time news interview slot yesterday about the consultation – listen on BBC iPlayer here (skip forward one hour and six minutes).